Madonna's application to adopt a second Malawian child was rejected. Pop star Madonna just popped off for an expensive Upper East Side pad, according to The New York Post. The Material Girl signed a $40 million contract to purchase a four-story, Georgian-style townhouse on East 81st street between Lexington and Third Avenue. While Madge can surely afford the pad, some real estate experts are saying that the Material Girl far overpaid for the place. No residence in that area "has ever sold for $20 million, let alone $30 million -- or ever will again," one broker who asked not to be identified told the Post. The place may have some bad "vibes" too. The 26-room mansion is located near the Lexington Avenue subway line, and the train can be felt vibrating the foundations as it passes underneath. The home does boast nine fireplaces, 13 bedrooms, 14 bathrooms, a two-car garage, an elevator and a wine cellar and a 3,000 square foot garden. On the downside, it’s not ready to move into. Madonna, 50, plans major renovations to the town home, along with security upgrades. 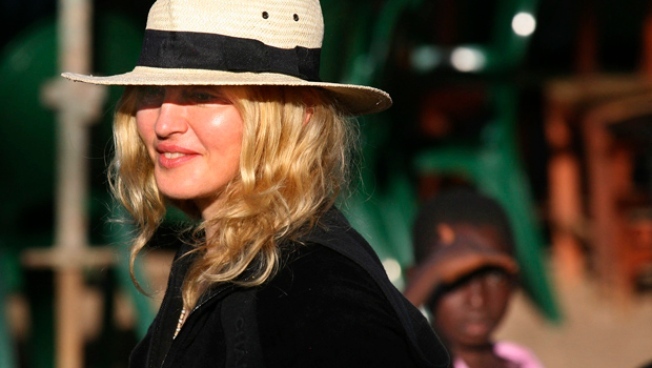 The $40 million purchase throws into question Madonna’s plan to move to the African country of Malawi. The singer had said that she would move to there for 18 months in order to satisfy a judge’s order and complete the adoption of her second child from that country, four-year-old Mercy James. Her new New York address is oceans away from that sub-Saharan country. "Madonna has a big beautiful plot of land over there already," a source told The Sun newspaper in London. "She's planning to build a girl’s school. But she's gone back to the designers and asked if they could accommodate a family home on the plot or on adjacent land." To see more pictures of Madonna's sweet new crib, click here.